Crop protection products, also known as pesticides, play a huge role in crop health. If you’ve ever had a big garden before you know that insects and weeds, diseases and other pests, can quickly rob your yields and take that food production down to zero very swiftly if not properly monitored. It may come as a surprise to learn that pesticides have actually been used in agriculture for around 4,500 years and are also used in organic production. The good news is that today’s products are much safer than they were back in the day…. technology has improved every aspect of our lives and farming is no exception. Today, less than 2% of the population of North America are farmers and ranchers, and they must take close care of their crop if we must sustain a global population of eight, 9, 10 billion people. Maximizing yield is important to prevent deforestation and keep farmers profitable and in business. Enter AGCO’s new sprayer technology and training center for beginning applicators. When farmers manage pests with chemicals, they are required to hold certain licenses, certifications, and go through training to use them responsibly. AGCO has taken this a step further by partnering with the Asmark Institute to open a new state of the art training center in Bloomington, IL. This specialized curriculum and applicator training course teaches beginning applicators proper application of crop protectant products and plant nutrients. The curriculum is quite comprehensive and includes but is not limited to: measurements for proper pesticide mixtures, fundamentals of machine maintenance, safe operations of machines, understanding sprayer components, importance of record keeping, and proper tank clean out procedures. I believe sometimes consumers have concerns. What is being sprayed on my food? Why? Should we be worried? I believe these are valid thoughts, but it is so important to ask real farmers about what they do and why. 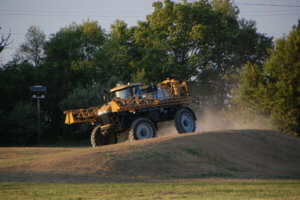 Folks may be surprised to learn that these products are applied at extremely minimal rates – say, a few ounces per acre nowadays, usually only a couple days a year. Farmers proudly eat what they grow and are held to very strict standards to ensure your food is safe. Over 99.9% of pesticides we consume are naturally occurring within the plant itself and for synthetic residues to harm mammals we would need to eat hundreds or thousands of servings in a single sitting! More on that topic here, and always wash your produce!